The SAS Maverick hunting bow is a hallmark of traditional bowhunting. From its beautiful and rustic appearance, to its elegant and prim design, it is a worthy addition to any hunting bow collection. Traditional archers are encouraged to purchase this model, as it adheres to conventional standards of hunting bow craftsmanship and design. This hunting bow ranges between 40 and 5 pounds and makes the perfect hunting companion. Considering the price and the value, this hunting bow in unbeatable in quality and savings as well. If you are a novice or moderately skilled bow hunter, then this product is perfect. This product comes in several weights, most of which are the same price. This product is reinforced with fiberglass, and clad in beautiful, maple, laminated material. Furthermore, the riser contains a lovely fusion of zebra, kulgam and makore wood as well. This 60-inch bow is specifically designed for right handed bow hunters. While powerful, this bow comprises a narrow and elegant shape. In terms of aesthetic beauty, performance and comfort, this product delivers results without fail. There are many advantages to using this hunting bow. Firstly, it is great for entry level or minimally trained bow hunters. Thus, you have the capacity to improve by practicing on this bow. Another benefit of this hunting bow is that its beauty is simply undeniable. Upon first glance, the rich color, curvature, and construction are just visually harmonious. The muted color allows it to blend in seamlessly in natural environments, making it perfect for stealthy hunting. Not to mention, this product comes in several weights which means you can tailor your bow to you individual strength and experience. With its slender shape and comfortable feel, this product is made to nudge itself perfectly into the human grip. In spite of its positive reviews, this product has its share of cons. While some longbows reduce shock and vibration, one customer takes note of the vibration this product produces. Of course, the majority of the reviews were exceedingly positive, so this may be unique to this customer’s experience. This product has several verified customer reviews. And of all the positive reviews posted, 100% of them provided 5-star ratings. So, what did customers have to say about this product? Firstly, this bow is speedy, precise and very powerful. It delivers shots with absolute strength and accuracy as well. 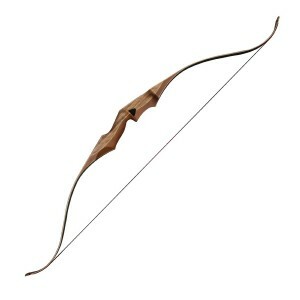 According to some reviewers, this is the best, traditional bow that you can find under $200. The majority of all customers agree that this bow is beautiful in design and craftsmanship. Some even remarked that its beauty is more pronounced in person. Overall, they praise the looks, performance, and functionality of this bow. According to many customers, this bow provides a comfortable grip and an easy shooting experience as well. Novices expressed that this was an exceptional choice for a first time bow user. The lightweight construction and easy handling is yet another feature these customers loved to praise. The levity of this bow permitted seamless and fluid movements, facilitating the shooting process entirely. Based on the countless five-star longbow reviews and ongoing praise, this product is highly recommended. Every customer review seemed to align with the desktop and specifications provided by the company. Based on the description and reviews, this product has everything you look for in a hunting bow-speed, traditional construction, beauty, precision and easy handling. If you want a lightweight, traditional, beautiful, accurate and easy to handle hunting bow, then you should buy this product.